Get with the Program! Turn YOUR home into a nontoxic household. Vermont Soap is YOUR partner in replacing conventional formulations with products natural enough to be certified to organic food standards. Natural is a process…not a result. Natural and organic cleaners and body care products look, feel and act slightly different from petrochemical ones. It may take a couple of tries before you get comfortable with your purchase. We encourage you to experiment so you can find the product that best fits your skin type, reactive body or special requirements you may have like needing unscented products. At Vermont Soap we do it right, using 100% natural and certified organic plant seed oils like palm, coconut and olive. Scent and astringency comes from using natural essential oils like orange, lavender and pine. We add plants and plant concentrates like organic aloe, cinnamon, orange peel and oatmeal. Our ingredients ARE organic food. Fake scents, fake colors (mineral colors are used in a couple of products), dangerous preservatives (we use natural and organic rosemary extracts to protect natural oils from oxidation). MOST Vermont Soap products are certified to USDA organic food standards by Vermont Organic Farmers. Organic certification means AUDITED NATURAL from field to bottle. This company was founded to make high quality certified organic products available to EVERYONE (link to mission statement). We offer FREE SHIPPING on consumer orders over $35, Bubble buck bonus points towards FREE GIFTS with every purchase, WEEKLY SALES and DISCOUNTS, and special DISCOUNTS for BULK purchase, DENTS, BENTS, SECONDS AND THIRDS. We also have a Discount Factory outlet and Soap Museum in Middlebury, Vermont. With Vermont Soap you can have fun and save BIG by buying Factory Direct. While we may not be able to change all that we perceive of as wrong in the world, we can create a circle of positive influence around ourselves. We call this the oasis effect. By staying present and positive and making the most sensible, sustainable choices possible you create a chain of good both in and out of the marketplace. Be a part of the positive change towards a more socially and ecologically responsible way of living by paying attention to who your money benefits. 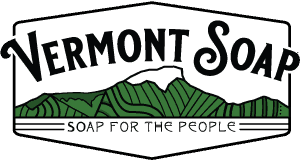 Since 1992 Vermont Soap has been supporting local Vermont jobs by employing craftspeople who care about creating top quality products, and supporting farmers growing organic raw materials around the world through our purchases. Vermont Soap supports the advancement of production level artisanal soap making in West Africa and has worked in Ghana and Guinea improving the quality of village made shea butter for international export markets.